Chicken fingers are a great fast meal. Easy chicken fingers recipes are the perfect answer for busy folks who don't have time to cook, especially if you're feeding a household. 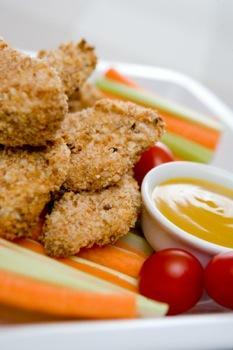 Children love finger foods and chicken fingers are an all time kid favorite. Chicken fingers are a quick go-to meal, but if you're trying to keep your family's health in check, you want to avoid boxed, frozen, or deep fried chicken nuggets. Thankfully there are a ton of easy chicken fingers recipes out there for making fingers at home and they're a lot faster to make than you might think. These chicken fingers are super easy to make for those weeknights when you just don't have time to prepare a big meal. Topped with whatever dipping sauce your family prefers, these nuggets are not only a healthier choice than going out, they actually taste better! Mix breadcrumbs and salt together. Set up a bowl with the melted butter and another right next to it holding the breadcrumbs. Set up a very lightly greased baking pan next to the bowl of breadcrumbs. Dip the chicken strips in butter and then roll breadcrumbs, covering them completely. Place breaded strips in baking pan as you finish them. Bake the chicken fingers for ten minutes, then turn over and cook them another seven minutes until they are brown and juices run clear when poked with a fork. Serve hot with your choice of dipping sauce such as honey, mustard, barbecue sauce, etc. Sometimes you want a spicier chicken entree that's still quick and easy to put together. If that's the case, this recipe will add a little heat to your dinner without setting sensitive tongues on fire. If you want to take down the heat a little, cut the amount of pepper in half for a dish that's still flavorful but a little less spicy. Mix flour, paprika, salt, pepper and chili powder. Coat chicken with butter and then toss with flour mixture. Set coated chicken strips in a 9x13 inch baking pan as you finish them. Turn chicken strips and bake another 10 to 15 minutes longer, until they are brown and juices run clear when poked with a fork. 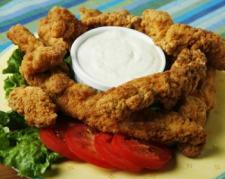 Try dipping your chicken fingers in ranch. If you've maintaining a gluten free household, it can be tough to find recipes for basic meals like chicken fingers. These strips will hold up well to baking and won't cause a gluten reaction. Kids and adults will love this dish whether they're gluten-free or not! Crumble gluten-free bread with your fingers until you have fine breadcrumbs. Alternately, you can use a coffee grinder or food processor to grind them up. Mix all of the spices together in a separate medium-sized bowl, then add breadcrumbs and mix well. Drag chicken strips through butter and then through breadcrumb mixture. Bake in a 9x13 inch baking pan for ten minutes, then flip strips and cook for another seven. Strips are done when juices run clear.